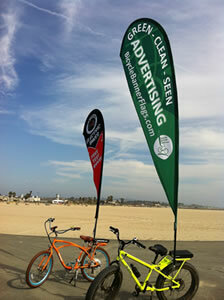 Bicycle Banner Flags are more than mere advertising, they are advertising in motion! 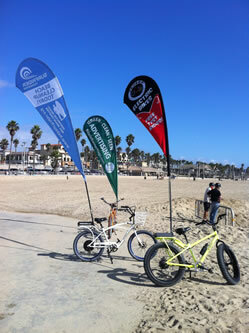 While ordinary banner flags are stationary, our Bicycle Banner Flags can move and go anywhere a bike can go. When there's a crowd gathered, you can ride and fly your banner flag and advertise your message. Contact us today to get your message in front of your target audience where they live, work and play. Include our Bicycle Banner Flags in your next marketing campaign and see the results of this unique target marketing medium. Our advertising professionals will give your ad-campaign the personal service you deserve while offering the industry's most current state-of-the-art quality products. Our turn-around times are accurate and we offer better value for your advertising dollars. Imagine where you could ride and advertise. Any day, any time, anywhere, you decide. Sporting events, convention centers, concerts, fairs, festivals, college campuses, parades and anywhere else a bicycle can ride. For more information see our [FAQ] page. While we wrestle with this recession, innovation has presented opportunity ready to explore. In the world of outdoor advertising we know advertisers need to reach their target audience. So we are being innovative and introducing what we believe will become a rage in target marketing. 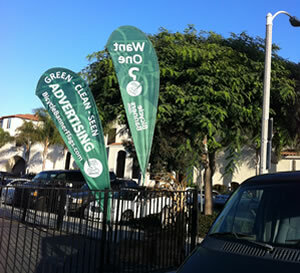 We give advertisers the green alternative to traditional outdoor advertising. We have created the concept of sailing the very popular Banner Flags on bicycles. It is such a simple idea. We have achieved the most eco-friendly method of visible mobile marketing. We believe this will become the rage in mobile marketing. We have seen from our own experiences the consistent and dramatic impact these larger than life Banner Flags have and we are anxious to hear from you about the unique experiences and ideas you, as our valued customer have encountered with your Bicycle Banner Flags�. Please share with us at info@bicyclebannerflags.com.